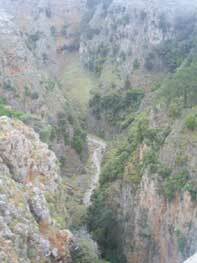 The White Mountains is the biggest and most famous mountain range on Crete. The highest mountain, Pachnes, is 2.452m high. The White Mountains is popular with hikers. Having said that, there are no cable cars or any of the usual infrastructure typical of mass tourism in the mountains. The region is sparsely populated, meaning that experienced hikers can enjoy the wilderness in a way that is difficult to find elsewhere in Europe. Less experienced hikers can walk the famous – but unfortunately totally overcrowded – Samaria Gorge, by far the most famous walk on Crete. 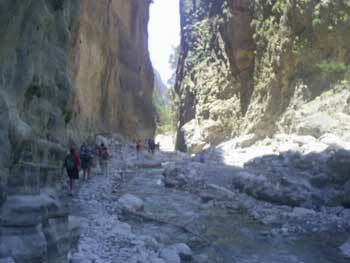 In summer time thousands of people undertake the long, hard journey through Samaria Gorge on a daily basis. The main starting point for hikers in the White Mountains is its only village, Omalos, which sits in the centre of a plateau. Even though Omalos has only ten houses, it’s considered to be the big town of the region. You can rent rooms in some of these houses, but the best accommodation by far for walkers is the only mountain lodge on Crete, the Kallergi Lodge. It’s about two hours on foot from Omalos or the bus park at the beginning of the Samaria Gorge. The Kallergi Lodge was modernised a few years ago by its Austrian owner Josef Schwemmberger. The lodge has some fifty beds in dormitory style. It’s rarely booked out, even at the height of the summer season. The lodge has fantastic views of the White Mountain. The friendly warden (tel: 28210-33199) can give extensive information after dinner about hikes, people, culture and the history of the White Mountains over a few drinks. From the Kallergi Lodge there is a very difficult path winding up to the summit of Pachnes, which will take twelve hours to navigate – a night in the mountains is therefore part of this hike. Only those with plenty of experience of hiking should undertake this walk. Not all the hikes are so challenging, however, and there are plenty of easier hikes to other summits surrounding the Kallergi Lodge. From Chora Sfakia there’s another road going into the White Mountains. After 12km of road snaking over the mountains you reach the Anopolis Crete, which consists of widespread houses on a high plateau (600m). It’s also possible to climb Pachnes from here. 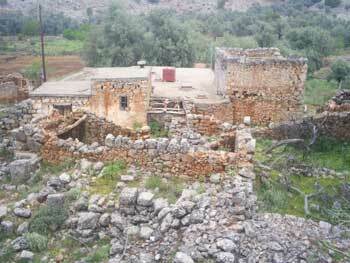 5 kilometer after Anapolis you’ll come across Aradena, which is an abandoned village. You can walk around here freely. 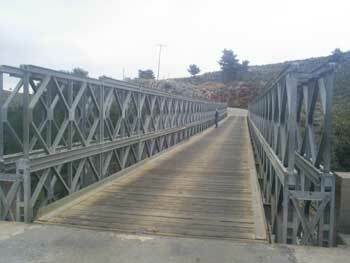 Just before Aradena, there’s a spectacular bridge over the Aradena Gorge. There’s a footpath down into the gorge from Aradena to Loutro, which, together with Samaria, probably one of the best hikes in Crete. The road ends in the small village of Agios Iannis (800m above sea level), 4km after Aradena. The traditional village is worth a visit. - It can be very dry, and you won’t find water. Take plenty of drinks. - It can be very cold at night, even in summer. Secondly, the weather can change suddenly without warning. Take appropriate clothing. - Because the region is under-populated, you can easily get lost. Do not walk alone, and bear in mind that mobile phones will not work up there. - In winter, the White Mountains close. Even Omalos shuts down. No buses, no accommodation, no food... nothing. The Samaria Gorge does not usually open until around 20th of April to May 1st. To Omalos: 3-4 buses a day in summer from Chania (2-3 in the early morning, one in the afternoon). By car it takes almost two hours. From Omalos it is two hours on foot to the entrance of the Samaria Gorge (the public buses go to Omalos and the gorge-entrance). Mountain bikes are prohibited in the Samaria Gorge. To Anopolis and Aradena: Until a few years ago there were 2 buses a day from Chora Sfakia. To our information in 2018 / 2019 these connections do not exist anymore.